Seeing is not a solitary activity, and it’s not simple. Perception is first of all dependent on context, not only because the specificities of an experience are ascertained through contrast, but also due to the ways each of our unique acculturations informs how we see. Comprehending visual information then turns out to be a social activity, evidenced most clearly in the debates that arise when we don’t see things the same way. And of course, these turbulent discourses around what is perceived are at the expense of appreciating just how much goes unseen—through suppression, movement beyond our sensory faculties, or systemically strategic elisions in how the seen social is structured. This then is one of the often tacit but urgent responsibilities of visual culture and art: to pressure and interrogate the boundaries of perception, to render the invisible visible. Changing how we see is first perceptual but actually political work, and it’s being done across viral Internet memes, sharp-witted turns in how organizations understand multicultural diversity, and artistic research into invisibility. At the end of February, a photograph on Tumblr sparked crazed debates around whether the depicted dress was white and gold or black and blue. The image has gone viral, as we came to realize just how incommensurate our shared perceptions can be. A lot has been written about why we are seeing the dress (which is actually blue and black) so differently—too much to some minds, as backlash across social media complained that the meme drew focus from more dire sociopolitical issues at hand. I don’t agree, as it happens. One Tumblr commenter writes, “If that’s not gold my entire life has been a lie.” The profound potential in recognizing our different perceptions is an erosion of our perceived differences, and further, a challenge to see what has been hidden from view. On March 6, the Salvation Army in South Africa tweeted a new image campaign that instrumentalizes this outburst of conversations about seeing toward socially progressive ends. A semi-reclined young white woman with lustrous blonde hair wears a white/gold variation of the much-discussed dress and is mottled with dark bruises on her face and bare legs. The tweet was captioned, “Why is it so hard to see black and blue? One in six women are victims of abuse. #StopAbuseAgainstWomen.” While the Salvation Army is not an unproblematic organization to my mind, this image shrewdly parallels what we can’t see with a social tendency to refuse to acknowledge continued oppression against women. However advanced or civilized it may be boasted that the world has become, those claims are an absolute nonstarter if they are at the continued violent expense (physical or otherwise) of women, people of color and other marginalized populations. Art history professor Delinda Collier spoke frankly about her South African roots and the ramped-up apartheid of the 1980s that drew her to specializing in African art; each new class she teaches, she said, requires an accounting of the tensions between her racial identity and the focus of her scholarship. Artist Wolfie E. Rawk spoke with openness and honesty, reading their own whiteness as intersectional with their dual citizenship in the U.S. and Germany, as well as how being transgender and epileptic augments being white in both countries. Particularly productive was the panel’s shared skepticism around a focus on white guilt as risky attention seeking by white people complicit in racist systems of oppression. The discussion revealed how little expertise has been cultivated in giving accounts of white experience or dismantling the remarkably troubling privilege granted to white people to be free of scrutiny under the cultural gaze, a sort of unseen neutral centrality around which all other races orbit in contrast. The most compelling aspect of this performed panel discussion was the position held by Brown herself: she was the organizer who neither spoke within the panel’s dialogue, never directly involved herself, instead operating through white proxies. This sort of nearly invisible management is a cultural position predominantly held by heteronormative white men. Brown’s occupation of the role was inflected with humor and indignation, a subtext to the afternoon’s proceedings. Along with disappeared minority oppression, social order is greatly dependent on an implicit agreement that we keep some things out of the picture. Glass Curtain Gallery’s “Invisible” shows just how unmanageable and complicated things become when artists tamper with the boundaries of the visible world. The exhibition begins with installations by Luftwerk and Kathleen McCarthy that continue investigations into color perception and space that really hit strides in 1960s Light and Space art. Beyond these projects, the rest of the works on view struggle to hold together, instead making a (productive) mess out of what is usually repressed. Paola Cabal’s gorgeous “Synopsis” projects a sequence of photographs of a life-sized figure perpetually shifting her makeshift pallet to follow the movement of light shifting across the floor. As she nears the joint of the wall and floor, the figure is gradually cropped, ghostly slipping between the planes of the gallery’s architecture. C. C. Ann Chen worked with a psychic to take energy readings of the gallery space, six scenarios of which Chen rendered in silverpoint on smooth white panels. 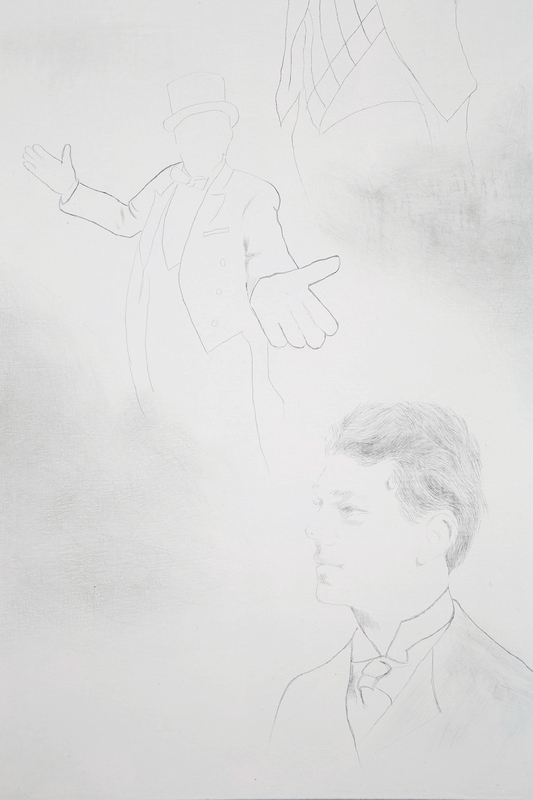 The powerful, faceless man drawn repeatedly on “The Ringmaster” hauntingly resembles the usual power player occupying the role Brown took for her panel discussion. 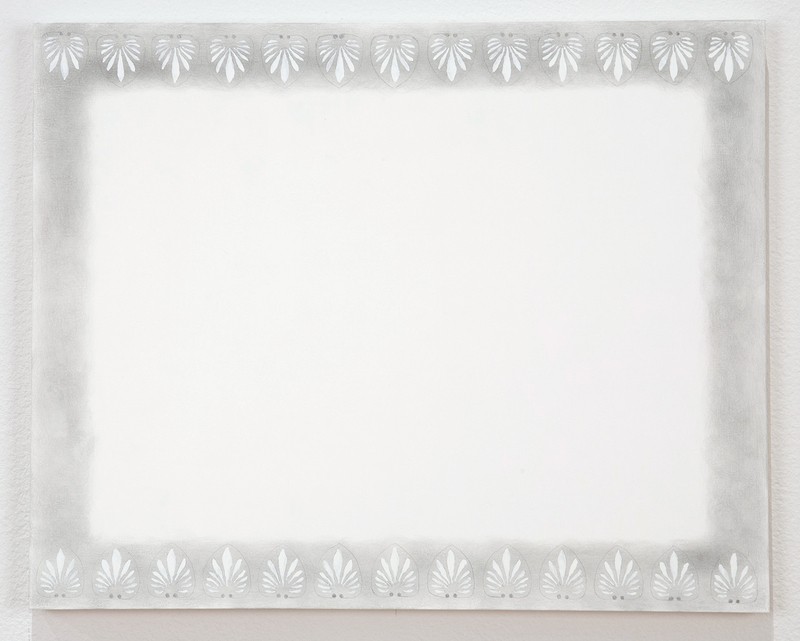 Chen’s “Untitled (TBA/playful)” hovers even closer to imperceptibility, with only a smudgy decorative trim framing the blank white rectangle. The darkly painted back room of the gallery is cluttered with Jessica Hyatt’s psychologically fraught installation. The video “You were there! 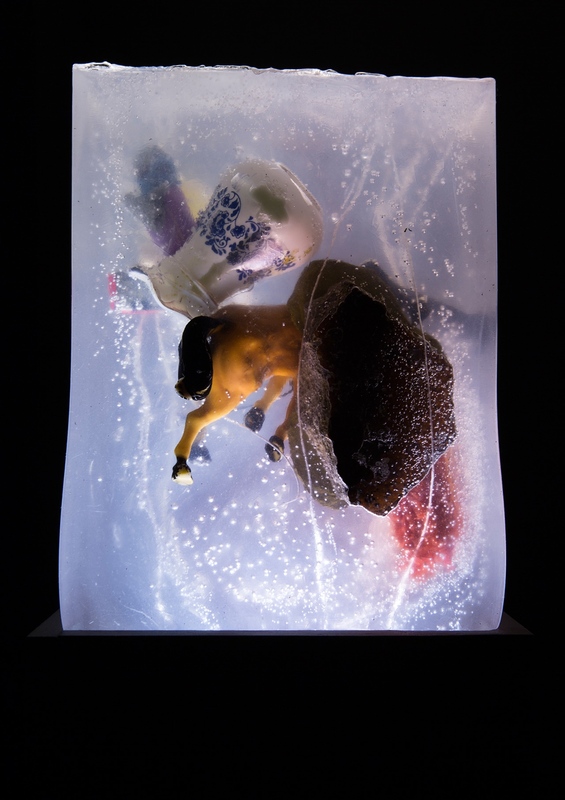 We were together.” shows miscellaneous mementos in a shifting still-life arrangement; the same objects appear in the gallery now suspended in a large block of clear ballistic gelatin, a material used to simulate bullet wounds on the body. There is way too much to process here as Hyatt draws together oblique autobiography and literary references into multiple videos, a sound work, photograph and sculpture; but without this excessive inclusion, the formalism of the exhibition might not have grasped the real weight of psychological repression that would prefer some things left invisible. Perception and social politics share terms of engagement: political pundits and PR firms assess “the optics” of a given circumstance; one turn in racial reform aims for “color blindness” as a means for equality; the controversy over the color of a dress was resolved with an explanation of “white balance” in an image—a phrase that holds uneasy charge if multiple meanings of whiteness are considered. The sighted subject and the society in which they reside conspire to organize the culture into what is seen and known versus what is invisible and taken for granted. What if, as the Tumblr post feared, the ways we’ve been encouraged to see the world have produced a life of lies? An insistence on new modes of social visibility is a start at letting go of that selective deception.